Digest-sized (5 ½" x 8 ½") comic book, 24 interior pages. Black and white ink wash with violet cardstock cover. Published April 2012. Caroline Herschel (1750—1848) was an astronomer living and working in England in the 1780s and '90s, starting as an assistant to her famous brother, William Herschel, who discovered the planet eventually called Uranus. Starting her observing career by discovering a nebula that had not been cataloged by Messier, she eventually discovered eight (possibly nine) comets, documented numerous corrections to John Flamsteed's Atlas of the Heavens, and wrote up an exhaustive star catalog of the Northern Hemisphere that was published by the Royal Astronomical Society of England. 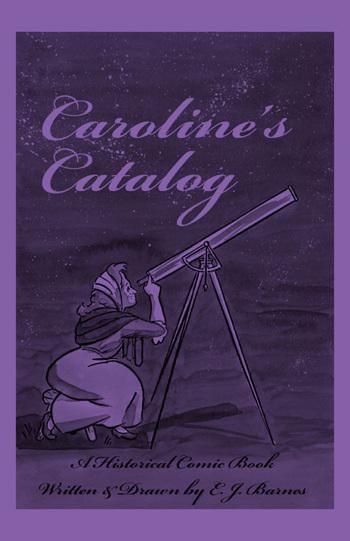 The most outwardly humble item in our [New York Comic Con] haul, E. J. Barnes's self-produced bio-comic of the 18th-century astronomer (and musician) Caroline Herschel, is also one of the most exciting from a Women's Studies standpoint. Girl power. E. J. Barnes does a nice job with the historical details, but where she really shines is in the life and personality she instills into Caroline Herschel, whose love for discovery and for life in general comes across loud and clear. In just a slightly more progressive world, Barnes' pamphlet could have been produced and handed out to students earlier this year to commemorate, say, Women's History Month. This is a fascinating story to anybody who’s interested in the stars and how humans got really good at cataloging them and other celestial objects, told in a relatable way from the perspective of an older woman (she’s depicted as 82 here) who has had time to contemplate her life and work. Which isn’t a shock, as E.J. has been doing great work for years now, but it’s very much worth checking out.